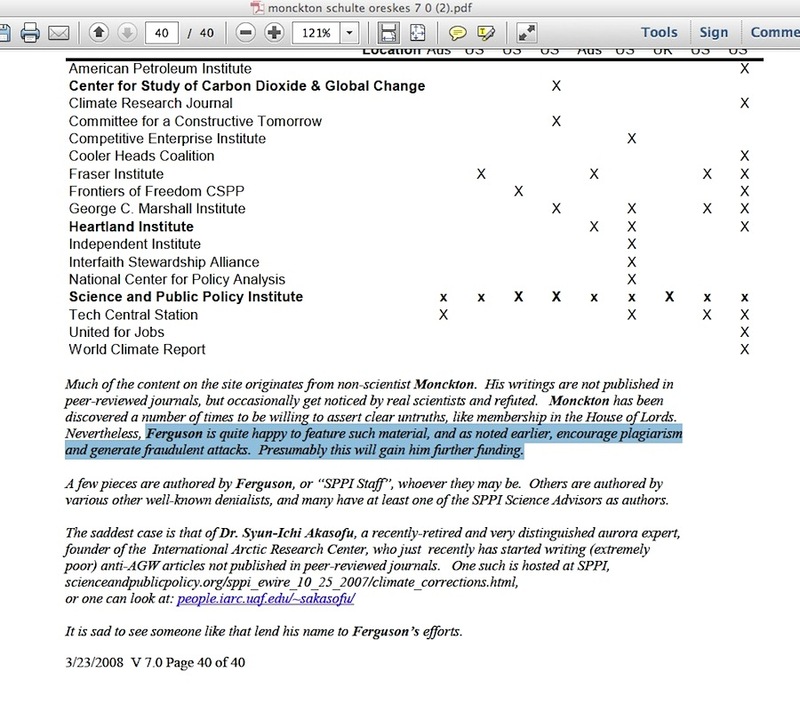 It isn’t hard to find criticisms of how the famous and supposedly non-political Science magazine has succumbed to a partisan anti-science position on catastrophic man-caused global warming (e.g. here and here), but since I have stated on several occasions, that I have no science expertise at all (which was twisted by my critics, e.g. here and what used to be here), I leave those criticisms to other experts. 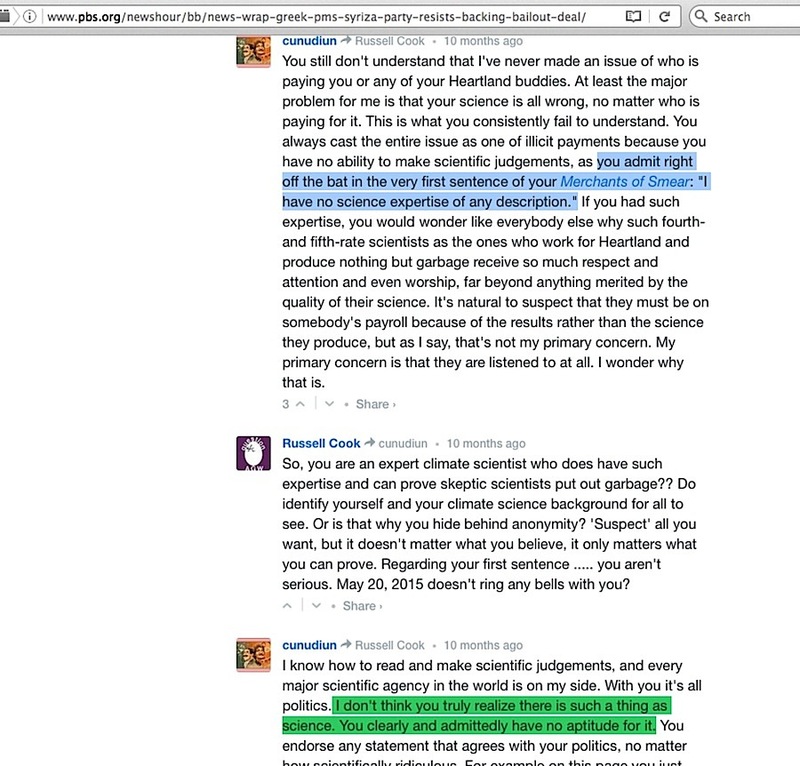 Today, however, I can use my own expertise to show how Science ran off the rails in 2011 regarding the single-source notion that skeptic climate scientists are paid industry money to lie…. and how this old situation has a direct tie to enviro-activists’ current efforts to use racketeering laws to persecute people who criticize the notion of catastrophic man-caused global warming. This was something of an accidental discovery on my part, but it only helps to solidify what I’ve long said about the way the ‘industry-corrupted skeptic scientists’ accusation falls apart no matter how or where it is viewed. 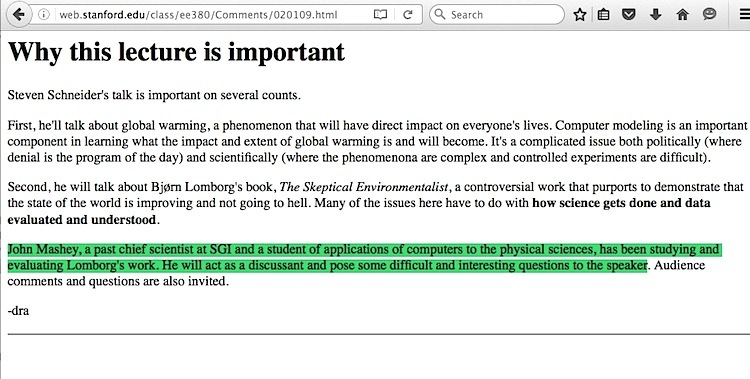 Long story short, I was looking into a semi-related topic and it branched into several different paths, including one to …..
… For years the denial machine and its campaign attracted little attention, as its operatives succeeded in masking their efforts as legitimate scientific debate while the interests and motives behind their attacks on climate science and individual scientists such as Benjamin Santer were largely shrouded from scrutiny (Oreskes & Conway, 2010). Investigative journalists, most notably Ross Gelbspan (1997), took the lead in analyzing the denial machine, and then a few social scientists joined in the effort (Beder, 1999; Lahsen, 1999; McCright & Dunlap, 2000, 2003). 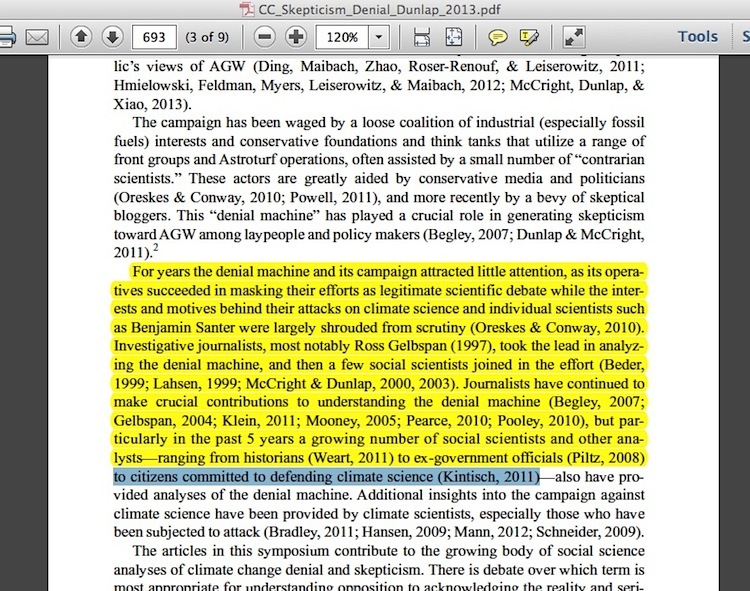 Journalists have continued to make crucial contributions to understanding the denial machine (Begley, 2007; Gelbspan, 2004; Klein, 2011; Mooney, 2005; Pearce, 2010; Pooley, 2010), but particularly in the past 5 years a growing number of social scientists and other analysts—ranging from historians (Weart, 2011) to ex-government officials (Piltz, 2008) to citizens committed to defending climate science (Kintisch, 2011)—also have provided analyses of the denial machine. 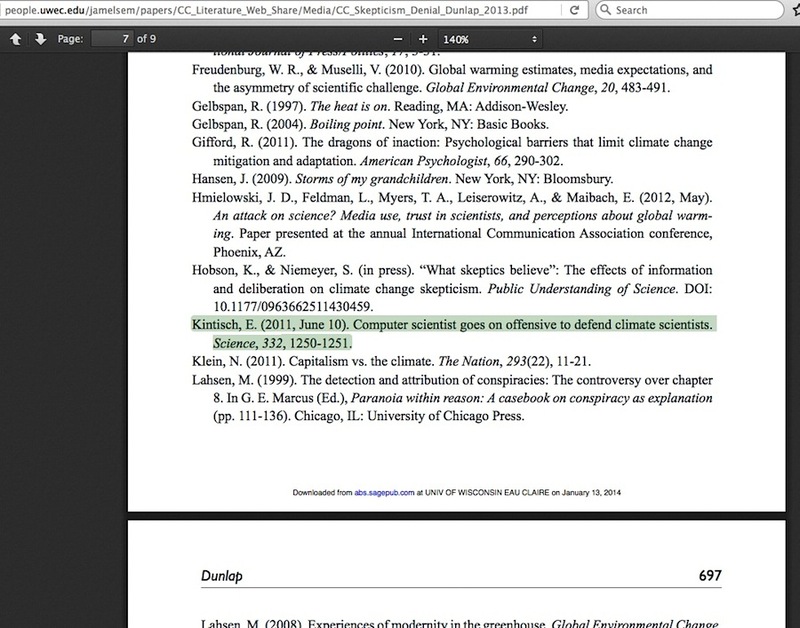 But I’d never seen any scholarly publication claim there were “citizens committed to defending climate science,” and I’d never heard of Kintisch. 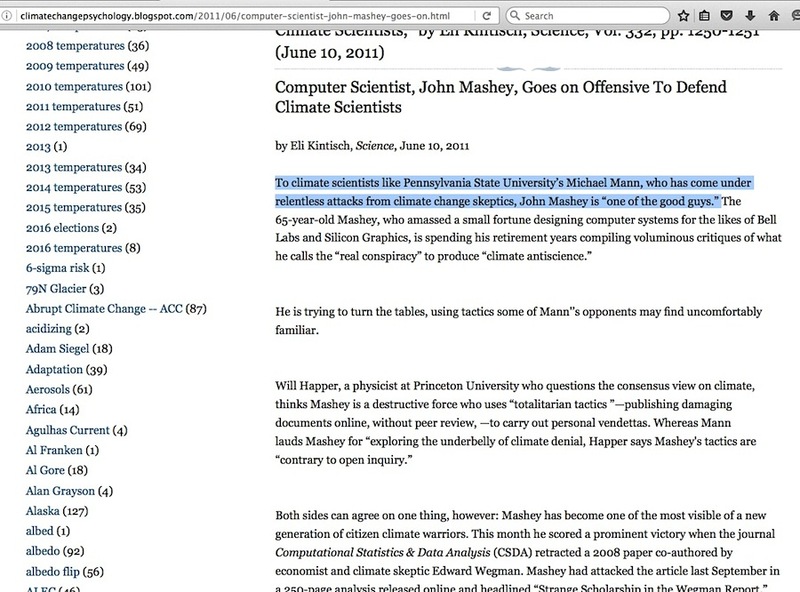 Turns out Dunlap’s source here is Science magazine’s Eli Kintisch, with the 6/10/11 article being “Computer Scientist Goes on Offensive to Defend Climate Scientists” (full text copied here) See the problem right away? “Citizens”, plural, erodes to become “computer scientist”, singular. What the article does instead is get itself into deeper water. 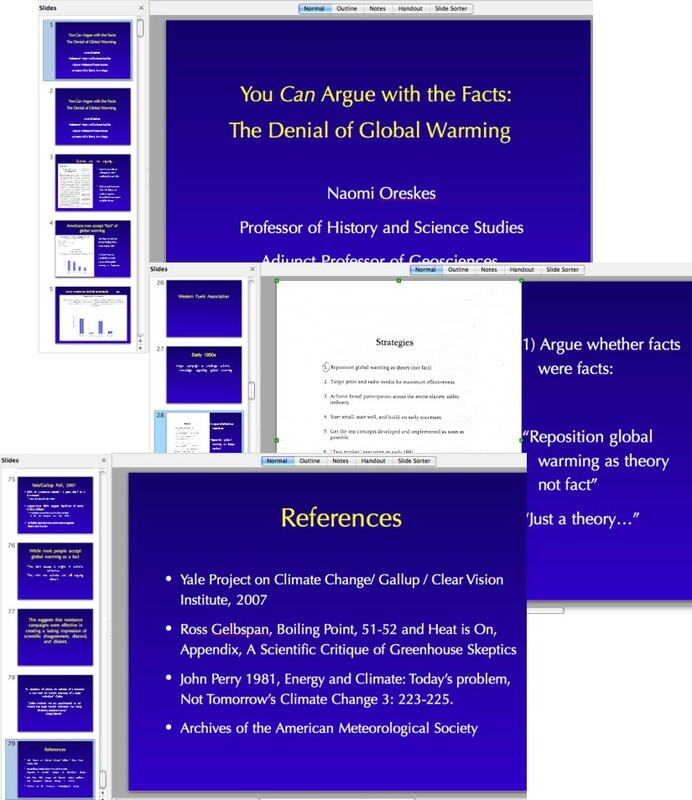 He was drawn into the swirling climate debate in 2007 after hearing a lecture on climate skeptics by University of California, San Diego, science historian Naomi Oreskes at Stanford University, which is near his Portola Valley home. 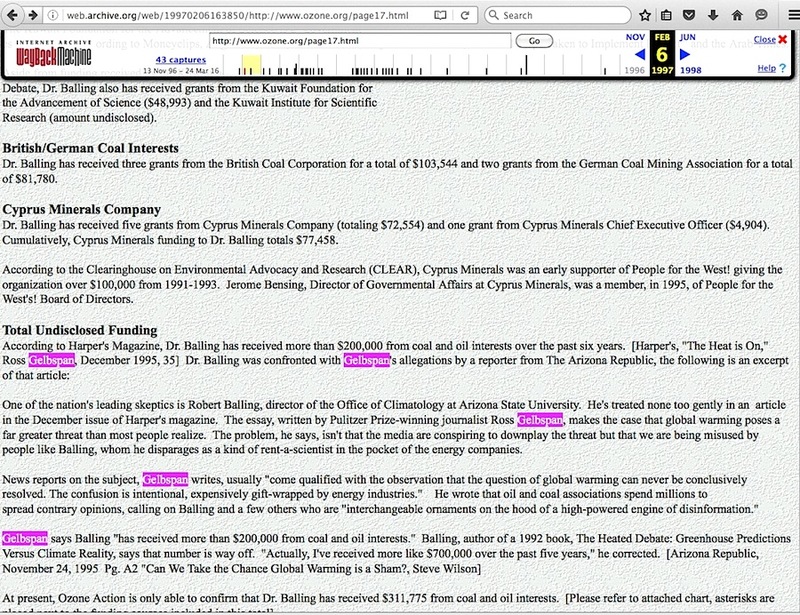 That seminar was held on January 9, 2002, over five years before he attended Oreskes’ presentation. 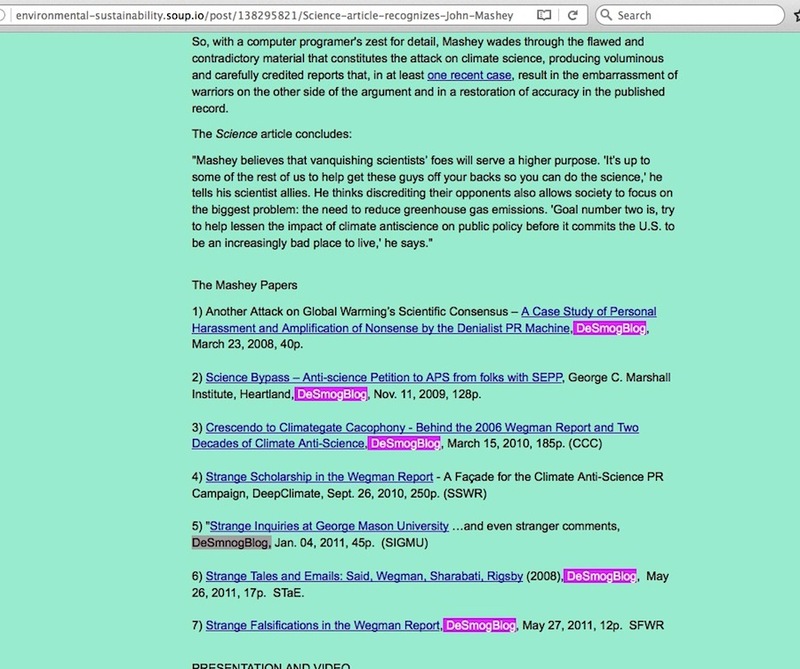 Schneider’s “Why this lecture is important” link at that page directly mentions Mashey in a way that would hardly be mistaken as a situation in which Mashey was not already drawn into the swirling climate debate. 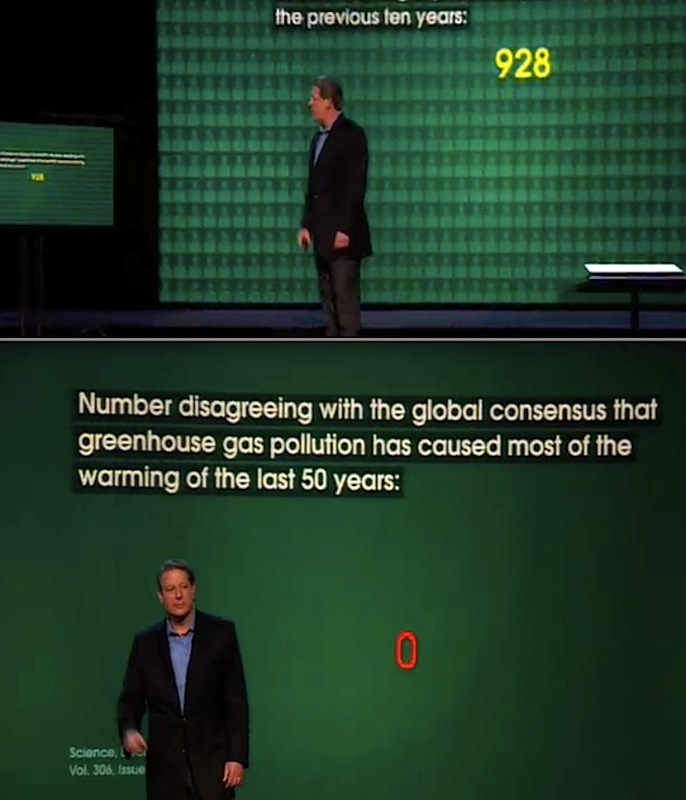 The Science article then apparently commits a giant sin of omission after the above questionable assertion. 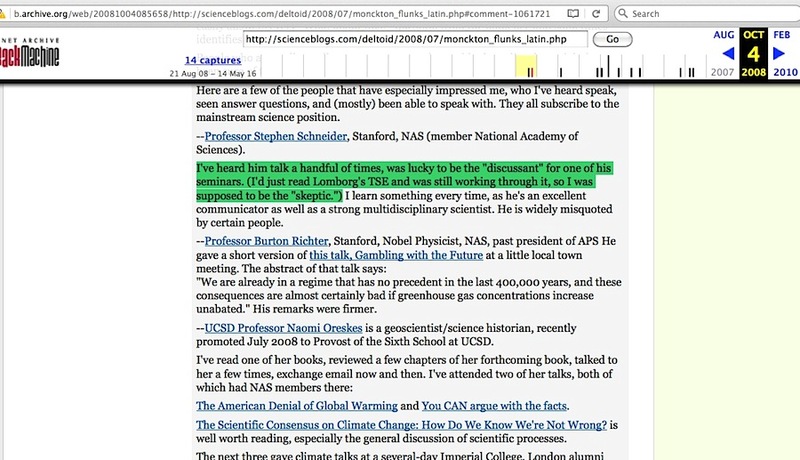 Who was this ‘nascent community of nonscientist climate bloggers?’ Mashey himself said in his 2012 Youtube presentation starting at the 11:07 point, “In 2007, I’d heard this speaker Naomi Oreskes … heard her give a really good talk on the roots of climate anti-science, and then there was an attack on her that was really nasty … In the meantime of helping Naomi defend herself, she introduced me to the Desmogblog folks who are based in Vancouver, and they have ended up helping me publish a bunch of reports…” Again, “allied sites” gets reduced to just one site, Desmogblog. 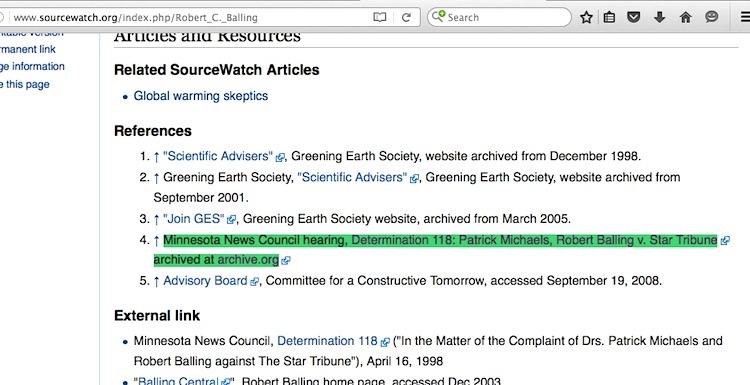 As apparently indicated by a site-specific 1/06-1/08 search which show Mashey’s earliest comments placed at Desmog posts, Oreskes’s introduction of him to the site could not have occurred after September 2007. Where did the documents he “prepared” first appear? 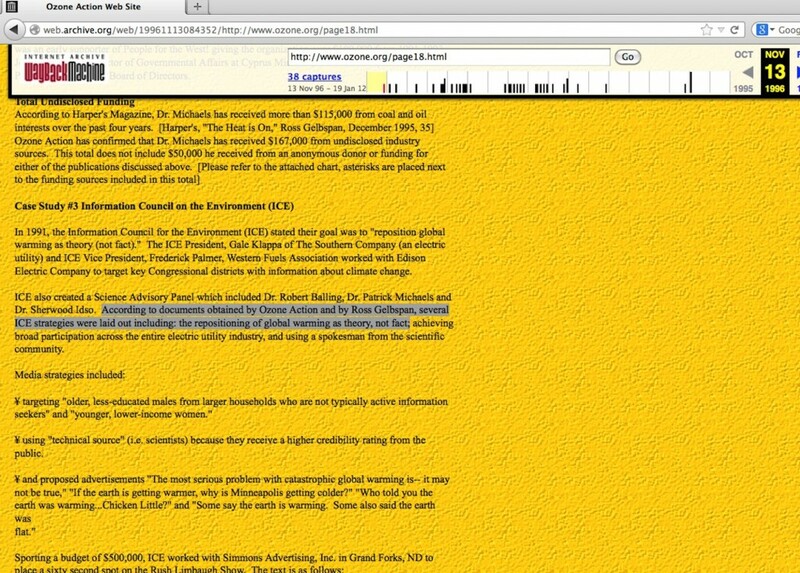 Just months later in 2008 at Desmogblog – an organization with arguably questionable beginnings. 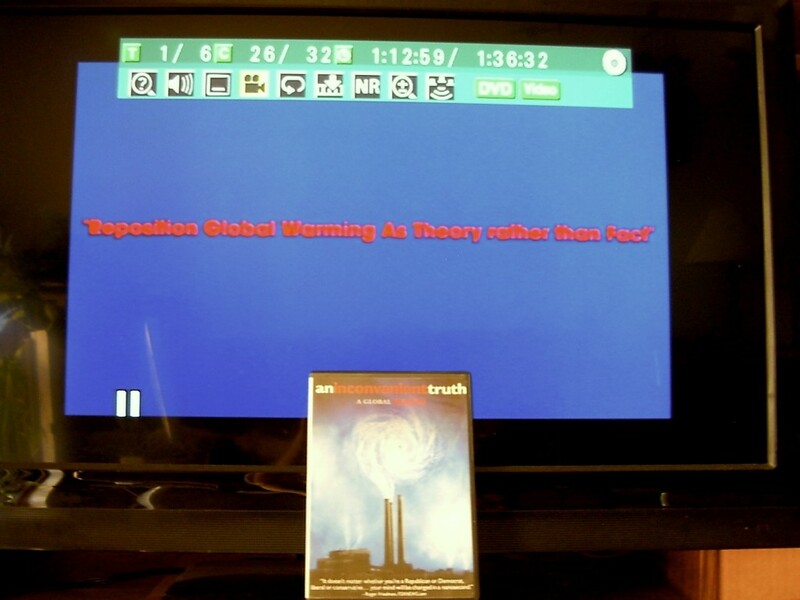 Readers here are welcome to dive into Mashey’s 40 page document if they wish to see whether he succeeds in defending the actual position of Oreskes’ starring role in Al Gore’s movie (more precisely described as her infamous 2004 Science magazine paper on the 928-to-0 consensus for man-caused global warming) or if it is instead an exercise in character assassination against her critics. What troubles me are instances within it where he mentions Exxon funding of people who are associated with Oreskes’ critics. 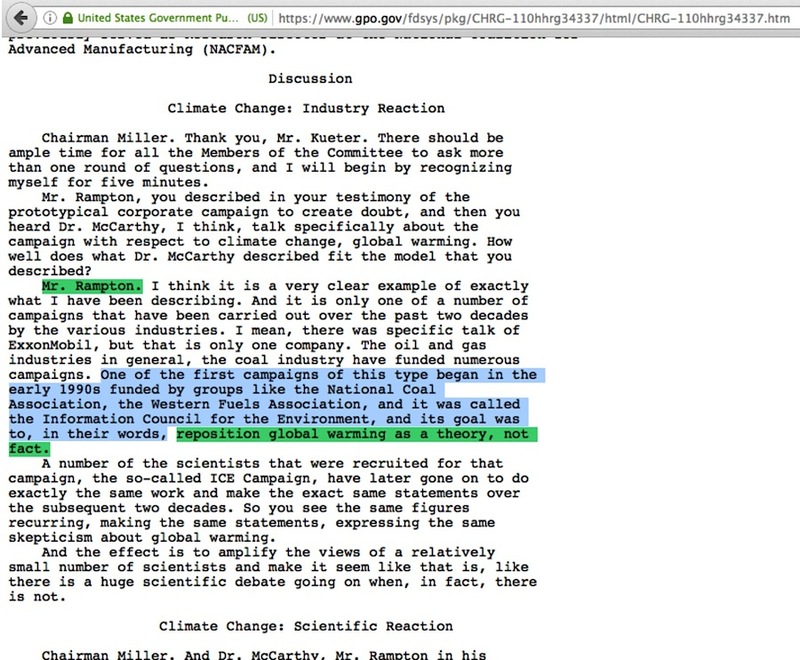 Readers get no further into it than the third page before seeing the Exxon name …… but not a scintilla of evidence is provided proving fossil fuel industry funding came under explicit instructions to fabricate false criticisms of Oreskes. Exxon is mentioned over a dozen times in the document, but the most that’s presented regarding what this means is simply speculation from Mashey. That’s not the end of it, that’s just another tip of the iceberg. 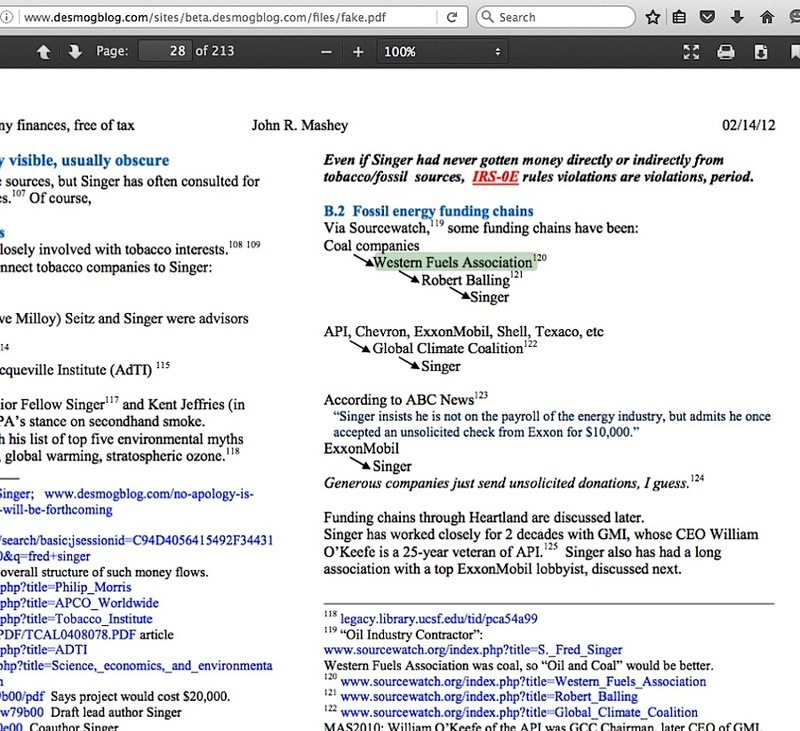 Mashey cites Sheldon Rampton’s SourceWatch site around 110 times in this document. 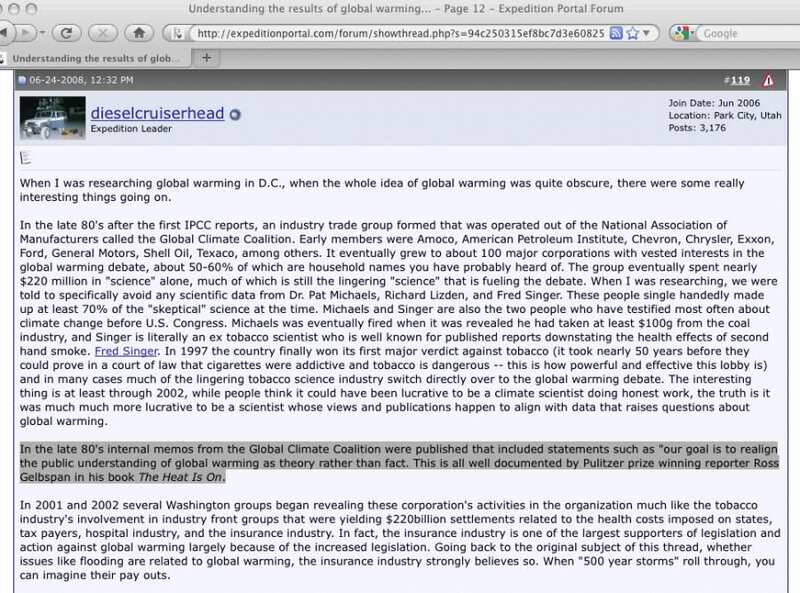 Who was Rampton’s primary source for the ‘corrupt skeptic climate scientists’ accusation before he formed SourceWatch? 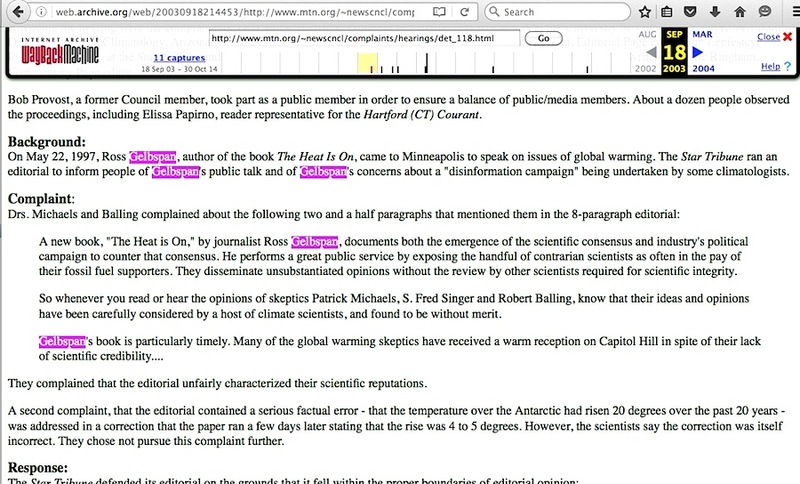 As I detailed in my February 10, 2015 blog post, it was Ross Gelbspan, And let’s not forget how it was Rampton who not only got the “reposition global warming” phrase into Wikipedia, but also into the U.S. Congressional Record (full text here). 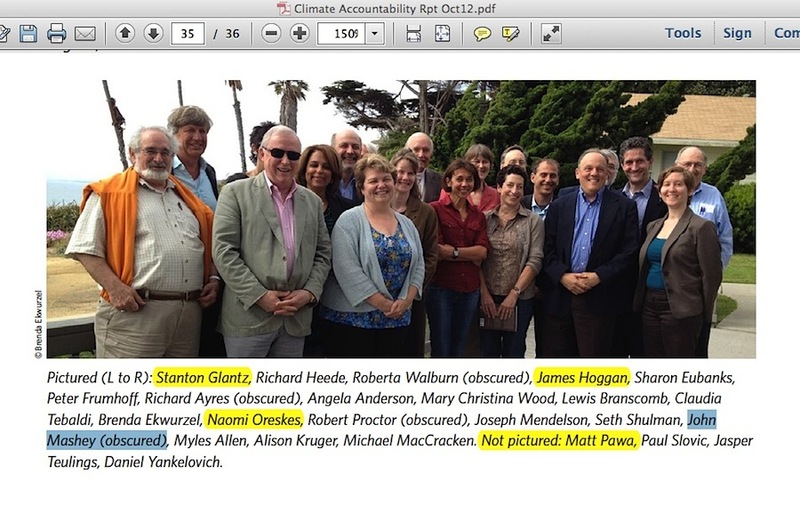 Can’t emphasize it enough: any prominent ‘corrupt skeptic climate scientists’ accusation is only separated from Ross Gelbspan by three degrees or less. 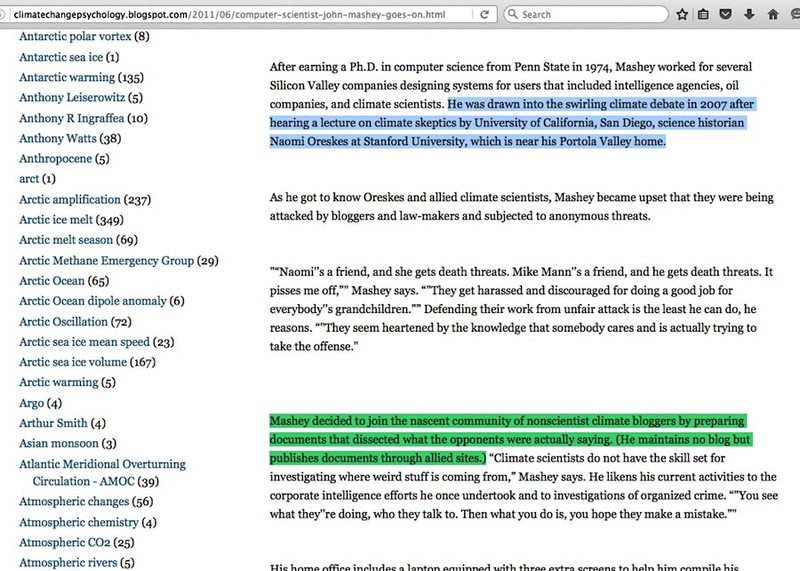 Science –> Mashey –> SourceWatch –> Gelbspan. 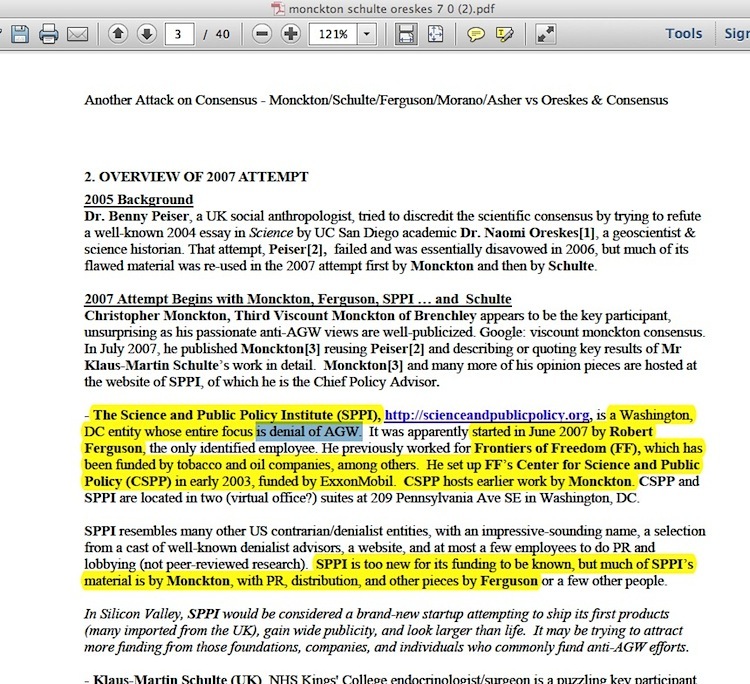 Anyone entering into any investigative effort – whether it concerns a science phenomenon, a legal matter, or a journalistic situation – while holding a preconceived conclusion and hoping that someone will make a future error, is the personification of what it means to be “anti-science.” An objective unbiased investigator gathers all evidence and analyzes whether conclusions about what’s gathered are valid. In my case, I didn’t enter into what I do with the objective of nailing Ross Gelbspan and people like him to the wall, it was instead a pair of favorable bits about him (here and here) which prompted me to find out more about his work. Regarding the very latest news of the U.S. House’s Science, Space, and Technology (S.S.T.) 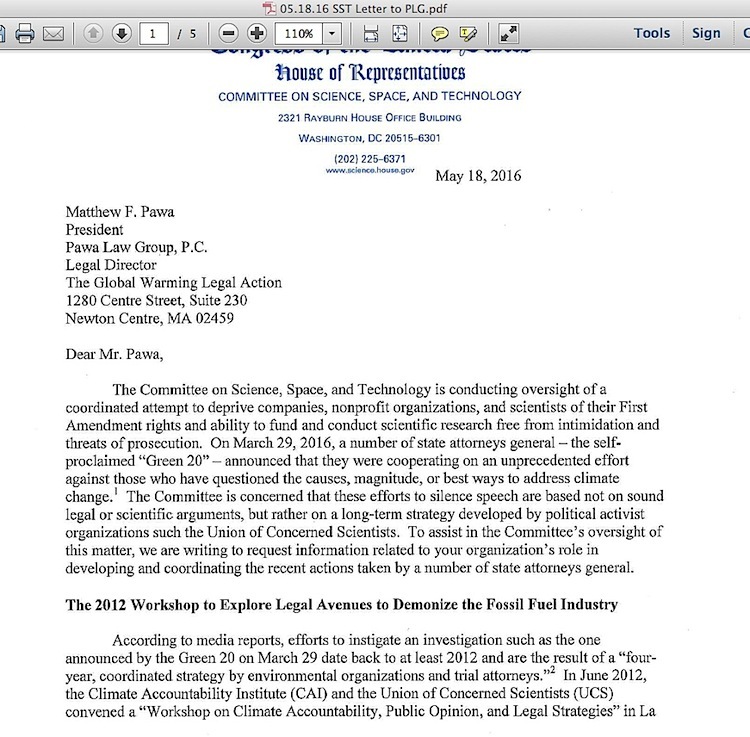 Committee request for information from particular enviro-activist groups and Matt Pawa’s law firm (one of three specific people I named in my 4/22 American Thinker article), it should be noted that the request concerns the situation surrounding a 2012 Oreskes-created workshop in which Pawa, along with Desmogblog’s Jim Hoggan were attendees. Desmogblog’s John Mashey was also one of those attendees. If the scope of the S.S.T. 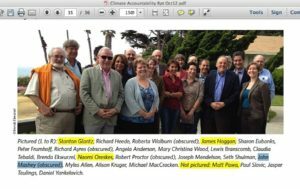 Committee’s widens to include requests to Oreskes and Desmogblog people, it is not my personal hope that those people will make mistakes, they either have done so already or they have not. 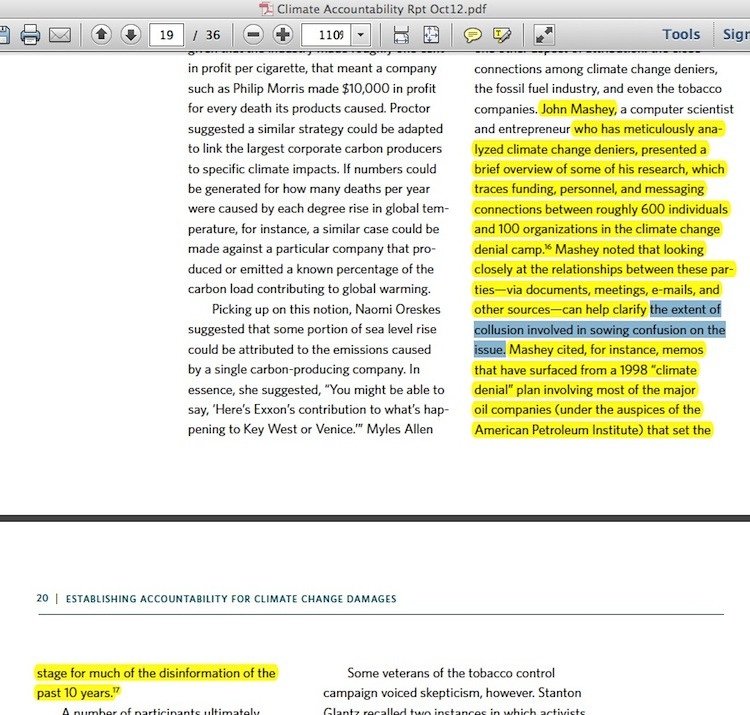 The goal is to get legitimate investigative questions answered in regard to the far larger question of whether one side or the other uses climate anti-science to impact public policy. This entry was posted in Desmogblog, Information burial, Three degrees of Separation or Less and tagged John Mashey by Russell Cook. Bookmark the permalink.